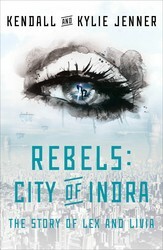 Today is the day Kendall and Kylie Jenner’s debut young adult novel, Rebels: City of Indra hits the stands! But you had to go to school / work / the dentist and can’t read it yet! Never fear–XOXO AfterDark has you covered. Read an excerpt of Chapter 1 here, and then order your own copy, or continue on to the book page for a longer excerpt. Rebels: City of Indra is told from two POVs, Livia and Lex. We couldn’t possibly pick a favorite, so we’ve given you a little taste of both! Happy reading, and welcome to the City of Indra, a place only Kendall and Kylie could have dreamed up! I’m breaking the rules, and I absolutely refuse to care. Veda gallops through the floating gardens and whinnies ecstatically as we pass the last of the designated security posts. Each gallop takes us farther and farther away from the main quarters, and closer to where the island ends and the clouds begin. For a moment, I forget I’m virtually a prisoner. I can leave this island, but not unsupervised. And even then, there is little I’m allowed to see, especially what lies below. Back in the main quarters, Governess will go to wake me from my rest. She’ll be displeased at my unexpected absence, to say the least, with so many tasks yet to be done: final gown mods, vitamin injections, rosebud cheek infusions, last-minute blemish inspection and evulsion. Then there is practice. There is always practice. The curtsy: low, but not unladylike. The conversation: pleasant, but not probing. There are fan drills to rehearse. The art of fan communication is delicate, this I’ve been endlessly taught. An incorrect flick of the wrist, a hereafter with a man I despise. Expand the fan wide to indicate interest. Tap his shoulder to flirt. Right hand: I am available. Smack closed: I daresay we are incompatible. I plan on using that last one a great deal. The guest list must be memorized, ranked in order of importance. There are more insults to perfect, not to mention an inhuman amount of grooming. Tomorrow is the most important day of my life, after all. I’ve been told it so much I’m starting to believe it and fear it. “Keep going,” I tell Veda. The rhythmic thumps of her hooves grow faster. A frenzied, unrestrained drumbeat. My mother loved music just as I do. She spent entire days on her air harp, her fingers dancing along its cords, weaving songs while painting her studio with colorful beams of light. My mother, according to Governess, was a charming conversationalist and graceful dancer. Governess tells me all about my mother, and she often repeats herself. There is only so much to tell. Only so many stories. I know that she designed her own formal wear, and enjoyed berries and chocolate after dining. That she favored the color blue, and wore one long braid down her back unless the occasion dictated a more formal updo. I know a great deal about my mother, and yet nothing at all. A sudden rush of cold smacks me across the face, the air off the clouds growing stronger. “Faster,” I tell Veda. I pass the hedge maze and Tranquillity Pastures. Roar underneath the welcoming gate. Not that anyone is really welcome. Not to Helix Island. I want to go faster than I ever have. Farther than I ever thought possible. Now, Governess will have gone from displeased to frantic. This is worse than skipping penmanship, worse than rolling my eyes when one of the debutees expresses her unfortunate opinion during Etiquette Training. What she will never understand: not saying those things takes a lot of effort. This is the farthest I have gone without a chaperone. Beneath me, Veda snorts with elation, and fear. “Don’t be afraid, girl,” I say. I hold my own fear tight, letting it surge through my body and push me farther. When I’m found, Waslo will be informed. He is sure to engage me in a Discussion. Waslo Souture was my father’s protégé. My father had friends as well, though I haven’t met any. They have good reason to keep their distance from the legacy he left behind. I can’t imagine Waslo was ever a friend to my father. A most talented student, I can’t deny, for his ascent into the Independent High Council is praiseworthy. If that’s the sort of thing you’d like to do with your life. Waslo has been around for as long as I can remember. There have also been Discussions as long as I remember. Perhaps he will choose “Respect for the Family Name” or “Appropriate Behavior as a Reflection of Upbringing.” Those classics I have committed to memory. Waslo grows especially passionate nearing the end of “Appropriate Behavior”; sometimes even a little spittle catches on his bottom lip. I wish I knew, I will think but never dream of saying. Instead, I will stay silent, head bowed in shame, waiting for him to finish. Hoping his spit doesn’t find purchase farther than his thin lips. I will feel inadequate, just as he intended. Perhaps this is why Waslo is so important: he has a gift for making others feel unsatisfactory. Waslo shouldn’t fret so much; soon I will be someone else’s problem. Strangely enough, the thought makes me laugh, hard enough to shift across Veda’s bare back. I can’t help but regard my laughter as highly unbecoming. But I do it anyway. I shake the pins from my head, letting my hair fall against my shoulders, allowing the wind to whip it into tangles, and surge forward. Read a longer version of this excerpt at MTV.com. There is a story that everyone in the Orphanage knows. It is not about family, hope, or love. It’s about genetics. Mutations. The ones that lurk beneath the earth, that are cloaked in shadows and hidden within the eaves of the cavernous mantle. Though I have never seen one, they have made orphans of many. If you listen closely while nestled in your too-small sleeper, you can hear their breathing beyond the security gates. Their bloodcurdling cries, their savage grunts. Each night, at lights-out, we feel we are at their mercy. That is why twice a year the caretakers round up orphans, no one knows how they choose, in the middle of the night while everyone is asleep. They are forced to walk outside in their bare feet, their slippers left bedside to be reused by someone else. They are taken to a junction and there they wait. How long they wait depends on how hungry the mutations are. The mutations . . . they can look like anything. The one I imagine has fused eyes and twin mouths that feed into the same throat. Its spine arcs so much it almost breaks through the skin of its back. Its pupils are the color of mother’s milk, and its jaws are powerful enough to snap through bone. When you’re brought to the junction, you’re left in the pitchblack. You cry, and every noise frightens you. You don’t know yet how to be strong. When they come for you, if they don’t eat you immediately, they will take you back to their tribe, far below, to be raised among them. They will put you to work, and your own body will betray you. It will become like theirs. Your legs will crack as they grow into new forms, and if you are pretty, you will lose that, too. Twice a year the mutations take orphans, gifted to continue our sanctuary here in the bowels of the earth. At the point where the City of Indra doesn’t care what goes on—we are that far beneath. There are greater worries. After all, who’s going to miss an orphan? Find out what happens next at MTV.com! The debut young adult novel of romance and adventure by Kendall and Kylie Jenner! Kylie and Kendall, I admire you since I was small. I must say that your background and impressive and I am especially glad that you writting a book. I am captivated by the beginning (even though I struggled to translate as I am French). I intend to buy the book because I love it. But I hope that there is a French version because it is difficult.